Kunya-Urgench was a major trade center on the Silk Road from the 10th-14th centuries, and the capital of Khorezm region. Its architecture has influenced building in Iran, Afghanistan and the Moghul Empire. The city was destroyed by Genghis Khan in 1221 and the Timurids in 1372-1388. It was rebuilt both times. In the 16th century it lost its capital function and fell into decay. The site was then abandoned until the 20th century, when it was used as a graveyard. It is still a local pilgrimage site. The archeological site contains many monuments from the 11th-16th centuries. Its Kutlug-Timur minaret dates from the 11th century and is 60 m. high. Its construction was an outstanding achievement for this period, only surpassed by the Minaret of Jam in Afghanistan. There are also two fortresses and several mausolea on site. 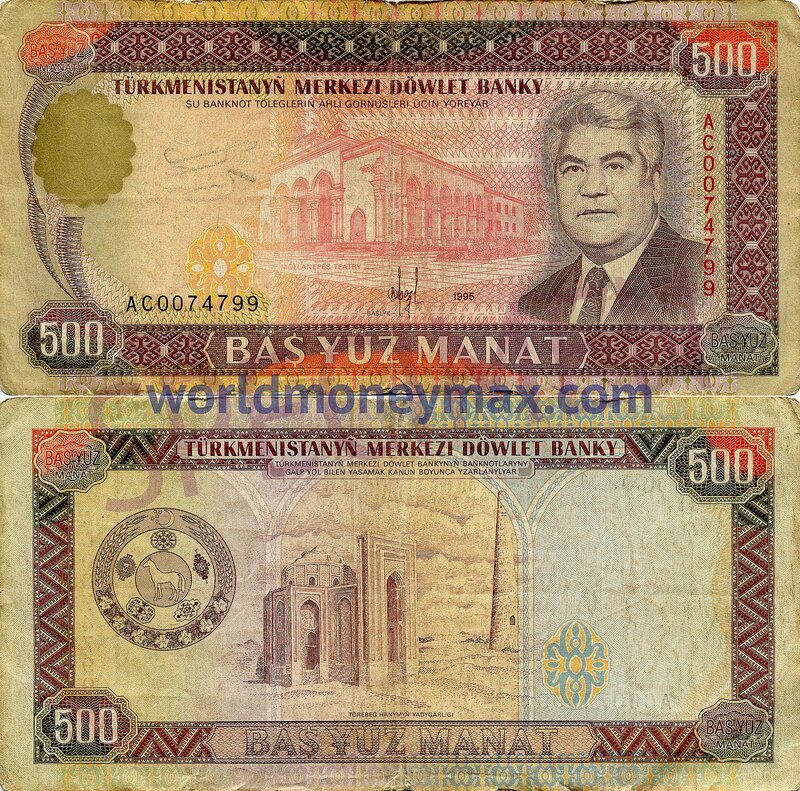 Kunya-Urgench (Old Urgench) in my opinion is the most impressive of the Turkmen WHS. It's a flat, deserted, hot stretch of land dotted with monuments here and there. The wonderful minaret (the oldest of its kind remaining in the world, and one of the highest buildings from its period) draws your attention right away. The adjoining Tekesh Mausoleum is now under construction but its turquoise conical dome is still visible. Visiting the site is well organized: there's a foot path that links the monuments. Some of them can be visited inside too, but often they have been taken over by groups of pigeons. Worth mentioning is the Torebeg Khanum mausoleum that has a wealth in mosaics. Those under the dome are put together like a calendar. What I liked about the atmosphere here is that it still is a local pilgrimage site. You can see stones placed on top of each other for good luck. There's also a spot where little cribs are left by women who pray to become pregnant. The site is also still littered with graves. This is said to prevent authorities from excavating here. There must be so much more left underground of this once powerful city! I visited this WHS in June 2017. Even though the area is quite big, it is not comparable to Ancient Merv. 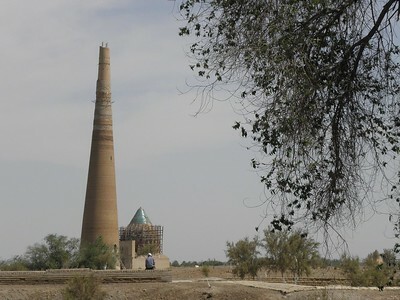 The different sites are a good example of how some of Uzbekistan's top WHS would look like without restoration. Moreover, the conical cap-like Islamic structures (top right photo) are in a way quite similar to Armenia's and Georgia's monasteries which I found quite striking. It's the mix of architectural styles and beliefs that I liked most in the ancient Khorezm capital as well as the fact that most remains are still believed to be sacred sites by the locals. The absolute highlight of this WHS is the Mausoleum of Turabek Khanym. It is the largest building in ancient Konya Urgench and its dome holds an impressive mosaic of 365 interlocking geometric tiles that give the appearance of the night sky (top left photo). The number of magnificently preserved arches, niches and tiling suggests time keeping and calendar keeping was kept in mind when building this structure. This is perhaps Turkmenistan's most important pilgrimage site and all pilgrims come to visit the Nadjm-ad-din Kubra Mausoleum (14th century). This mausoleum is quite similar to the Shah-i-Zinda complex in Samarkand, Uzbekistan but lacks the most of the magnificent turquoise and blue tiles on the mausoleum facades. However, the main tombstone inside has recently been fully restored and cleaned up to its former glory (bottom right photo). 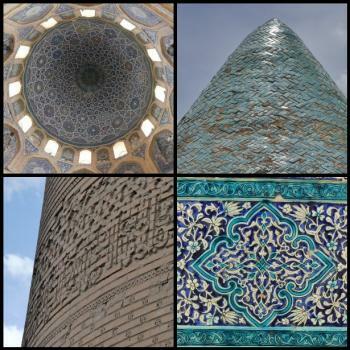 The tallest structure is of course the minaret with its Zoroastrian symbols and Koranic script (bottom left photo). Restoration efforts were much better than the reconstruction attempts to the upper part of the minaret which is now leaning and possibly damaging the rest of the original structure which has so far withstood very strong earthquakes without any significant problem. Overall, I'm glad I visited Turkmenistan's WHS as they helped me to better understand, appreciate and compare the restored WHS of Uzbekistan. That said, most probably I won't revisit Turkmenistan which has surely been one of the strangest places I've travelled to so far. So my suggestion is, if you have time allow 1 week max to experience the 'highlights' of this country but spend more time in Uzbekistan or Kazakhstan. I wouldn't recommend visiting Turkmenistan on its own as a country as its not worth it. It is perhaps a bit surprising that Kunya-Urgenche, the ancient capital of the Khorezm state (see my review of the Itchan Kala), has been inscribed when there are several other nearby Central Asian historic cities which have also been. But I suppose it is no different from the large number of European cathedrals which have succeeded! If you want to see it you have to run the gauntlet of the Turkmenistan bureaucracy – first to get a visa and then to get in to the country! I have included a section at the end on our hassles in Oct 2004 which may be of interest/use to anyone intending to go! If you still want to visit you will discover a dusty town, some mosques and a few scattered ruins (and virtually NO tourists! ):- In particular a very tall and somewhat rickety minaret looking a bit like a factory chimney and various tombs and mausoleums (photo). Some of these (e.g. the Mausoleum of Turabeg Khanym) are considered masterpieces of Islamic architecture of their era and would certainly appeal to enthusiasts. In 1219 Kunya’s ruler rather unwisely ordered the destruction of a caravan from Genghis Khan with the result that Genghis returned 2 years later and laid waste to all the cities of the area! Kunya recovered, but was destroyed again by Tamburlane in 1379 - the atmosphere of semi-desolation in the desert does have a certain appeal. To us however one of the most interesting sights was an area where local people came to pray for fertility. The ground and rocks were strewn with little hand-made dolls, tiny cribs and candles. A poignant reminder of the fear of childlessness in that society and also of the fact that Islam in Central Asia is mingled with non Islamic, shamanistic and Zoroastrian influences. Golden Horde: "In 1321, the town was annexed to the Golden Horde"
Sufism: "Najmeddin Kubra Mausoleum The holiest place in Kunya Urgench - Najmeddin Kubra was a famous teacher and poet who founded the Sufi Kubra order". There are 2 tombs inside - one for his body and one for his head, which were separated when he was killed by the Mongols in 1221. 35 Community Members have visited.